223 pages | 10 Color Illus. | 43 B/W Illus. Beach-spawning fishes from exotic locations on most continents of the world provide spectacular examples of extreme adaptations during the most vulnerable life cycle stages. The beauty, intriguing biology, and importance of these charismatic fishes at the interface of marine and terrestrial ecosystems have inspired numerous scientific studies. Adaptations of behavior, physiology, development, and ecology are gathered together for the first time in this book. Beach-Spawning Fishes: Reproduction in an Endangered Ecosystem is a comprehensive guide to beach spawning, a charismatic animal behavior that is seen in a surprising number of teleost species. This unexpected form of reproduction provides a window into the ecology of coastal areas, the behaviors and physiology necessary for fishes and their eggs to adapt to terrestrial conditions, and the threats and challenges for conservation and management. Beach-spawning species include important forage fishes such as the capelin, exotic fishes such as the fugu puffer, and the spectacular midnight runs of the California grunion. "Beach-Spawning Fishes covers the wide range of questions one might immediately ask: Is this behavior convergent or limited to a certain family? Which taxa behave like this? What are the habitat requirements? These questions and more are readily answered in the first two chapters of the book. Spawning in the intertidal zone is not limited to the night-time activities of the California Grunion, but to multiple families of teleost fishes. From a general background on overall behavior and evolution of this unique life-history trend, the book then moves from overall patterns of diversification to specific cases of beach-spawning behavior. Just as beach-spawning behavior is diverse across multiple fish families, the reproductive behaviors are highly varied as well as the preferred habitats. 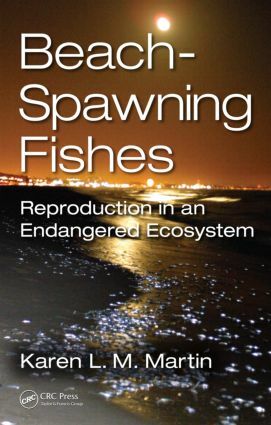 In this book, we see beach spawners make use of multiple reproductive strategies with an added twist of doing this all in low or receding waters. Running the gamut from evolution, physiology, life history, and conservation, Beach-Spawning Fishes is an excellent resource for your bookshelf. Just as the many chapters of this book cover diverse questions with regard to beach spawners, the ways in which this resource can be used are diverse as well. Beach-Spawning Fishes has many possible uses for education at the undergraduate, graduate, or professional level. This book is an excellent resource for a professor wanting to bring a textbook-based, in-depth focus on unique spawning strategies in fishes, and it could certainly stand alone as a textbook for a special topics course on marine fish behavior. Beach-Spawning Fishes would be a useful supplement to a reproduction chapter in an ichthyology class or a jumping off point for discussions on diversity and convergent evolution. Anatomy and physiology courses could benefit from the real-life examples of physiological processes discussed. Other portions of this book could be summarized for ecology courses as examples of food webs, ecosystem functionality, or embryonic development. As an extra bonus, this book comes in hardcover, and is also available as an ebook, further lending it to class-based use." How Are Emergence and Air-Breathing Beneficial for Beach Spawning Fishes? Karen L. M. Martin, PhD, is professor of biology and Frank R. Seaver Chair in Natural Science at Pepperdine University in Malibu, California. She is a fellow of the American Institute of Fishery Research Biologists, and active in the American Fisheries Society, the American Society of Ichthyologists, and Herpetologists, the Society for Integrative and Comparitive Biology, and other scientific organizations. She has published extensively on studies of animals at the interface between water and land and is associate editor of the journal Copeia. Dr. Martin's previous books are Amniote Origins Completing the Transition to Land, coedited with Stuart Sumida; and Intertidal Fishes: Life in Two Worlds, coedited with Michael Horn and Michael Chotkowski. After earning undergraduate and graduate degrees at Oklahoma University, she earned a doctorate in biology at University of California, Los Angeles, and completed a postdoctoral Friday Harbor Fellowship at the University of Washington. Dr. Martin received the Environmental Partnership Award from the American Shore and Beach Preservation Association, and the Conservation Achievement Award from the American Fisheries Society. Her award-winning short documentary, Surf, Sand, and Silversides: The California Grunion, has been screened at numerous regional and international film festivals, conferences, universities, and aquariums. She cofounded the Beach Ecology Coalition and the Grunion Greeters in order to work with multiple stakeholders on beaches to balance human recreation with wildlife conservation. Dr. Martin is an advocate for involving the public in scientific research.